At rest ! Rudder and Paddle in line with the water flow. At this time the Windvane is upright. Note:- The "tell tale" (a ribbon or similar) is in line with wind direction. A useful guide for checking Vectavane's performance. Boat comes off the wind. The wind then pushes more heavily one side of the Windvane - blowing it down in the direction indicated. Windvane movement is transmitted via linkage to the paddle thereby turning it. Paddle tries to act as a rudder by turning in the water flow. Now the water forces acting on the paddle are greater on one side and as the paddle assembly is pivoted at it's point of attachment to the main block, the whole paddle assembly is moved about the pivot pulling the steering lines in the direction indicated. Steering lines, in turn, pull the Tiller and Rudder combination in the directions indicated. Thereby turning the Boat to it's correct Course. As you can see, the principle is quite simple and powerful. The unit is self contained, so no adjustments are needed. One of our Steering Gears being presented to the residents of Weston Manor, an Island residential home for adults with learning disabilities. You see their Boat in the background. Using this gear enables those under instruction to better understand the interaction or relationship between the function of the gear, subsequent movement of the tiller/rudder and correct sail setting. VectaVane is an adaptation of a well tried principle, that of the "Hasler Pendulum". This system, not only gives adequate power on all points of sailing but is particularly good "down wind". This "down wind" advantage is better appreciated by understanding that whilst the wave shape moves, pushing the boat off course, the water itself does not. With the boat moving sideways as a result of wave action the VectaVane paddle tries to stay where it is in the relatively still water. Resulting in a sideways movement of the paddle. VectaVane then reacts, as though it had a signal from the windvane, thus bringing the boat back on course. All bearings are simple friction and are not tight thus giving long service and simple maintenance. Nothing in VectaVane is glued. The simple ball joints are adjustable and need never require replacement (except in the case of damage). Where possible all fixings, split pins and screws are "standard" for easy replacement. All autopilots and self steering devices MUST obey one rule to be anywhere near efficient. That is "the course correction forces must be proportional to the course correction requirement". That means that for a large course correction the forces must be large and for a small course correction the forces must be small. Otherwise you have "over steer". Your course then becomes a series of "zig zags" averaging the actual course required. To prevent this "over steer", the size relationship or area ratio between the paddle and wind vane of VectaVane are quite precisely calculated. When moving through the water with the device at rest, the wind vane is vertical and the paddle is trailing in the water. The force of the water acting equally on both sides of the paddle keeps it in a "null" position. Moving off course, the change of apparent wind direction endeavours to blow the wind vane down. This wind vane movement is somewhat resisted and modified by the reluctance of the paddle, due to water flow pressure, to come out of the "null" position. A balance between the two forces being achieved, VectaVane's response will be proportional to the course correction required. Materials: Stainless Steel - Marine Grade Aluminium (castings) - Marine Grade Nylon Bearings (underwater) Weight- under 22lbs (l0Kg). Abstracts:- "The materials selected for the construction of VectaVane are of sufficient strength to withstand normal working conditions and stresses The selection and mixture of materials will not readily induce electrolytic action. From the above calculations the Vectavane is adequately designed to eliminate the possibility of failure at speeds of up to 12 knots"
"Finding a windvane unit for Piper had been a long standing problem. The Contessa 26’s fine lines aft meant that most available units are too heavy to hang off her narrow transom without upsetting her trim but the demands of single handed sailing mean that reliable self steering is essential. Electronic self steering systems are great but rely on a good battery supply. Most of the systems on Piper have non-electronic alternatives. The Vectavane seemed the perfect solution. It is light, the whole unit weighs less than 10 kg and installation is very simple, by clamping the unit to an outboard bracket. If there is an outboard bracket already fitted it’s just a matter of tightening the two clamp bolts and running the tiller lines through a couple of small blocks. The design is kept as simple as possible, on a similar principle to the Hassler Vane. 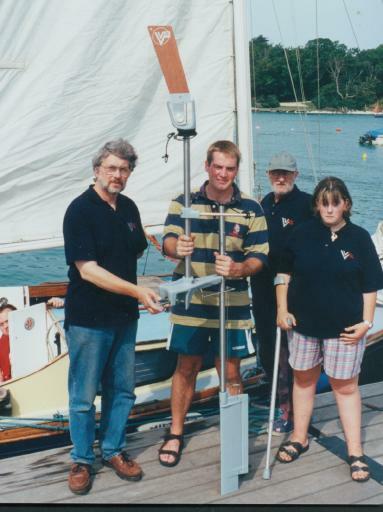 The windvane is a small flip-flop which, working through a trim tab, activates a servo-pendulum blade. This provides ample power for steering through the tiller lines. Control is very sensitive. Even in light airs the vane responded well and as the power for the tiller lines comes from the motion of the yacht through the water rather than the wind there is still plenty muscle available to keep her on track. I have an outboard motor stowage on the stern rail where I kept the Vectavane when not needed. Unlike many other vane gears the blade will not swing up out of the water but the whole unit must be unmounted. This must not be attempted with the yacht moving at any speed because of the risk of being pulled over the side. As the Vectavane was in use for most of each day it remained clamped to the outboard bracket. There are no markings on the vane’s swivel and once or twice I put the vane blade on the wrong way round. A dot of paint ended my confusion. I also added marks indicating the setting for Piper’s best course to windward on each tack. This made short tacks easy, allowing me to swivel the vane to the other tack then leave the unit to steer up through the wind as I dealt with the "sheets". As I get used to the Vectavane’s foibles I am getting more out of it and my minor adaptations have solved most of my initial problems. Given the high mileage and the exposed waters we sail, kit aboard Piper has a tough life. I look forward to reporting back on how the Vectavane copes as it becomes an established member of Piper’s crew". D R.